INDIANAPOLIS, Ind. 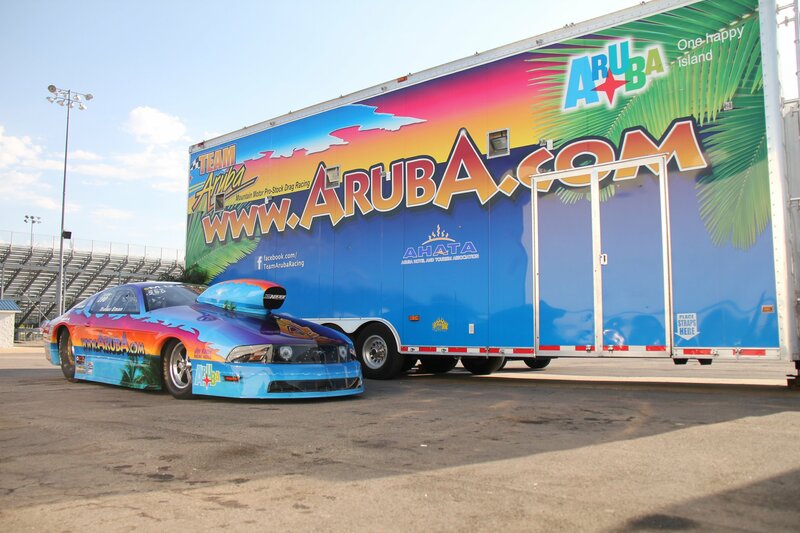 (July 17, 2017): Team Aruba just completed the fifth stop on the 2017 PDRA Tour at the historic Lucas Oil Raceway at Indianapolis. The hot and humid condition made for a tough weekend for the Aruba.com Mustang. Despite qualifying a very respectable fourth with a 4.097 effort, Trevor Eman fell in round one to Matt Giangrande. Giangrande pulled out his best number of the weekend, a 4.184, enough for a narrow victory over Eman. Despite the unfortunate early exit from the Mid-America Nationals, Eman and team are still in good condition to make a bid for the 2017 PDRA Extreme Pro Stock Championship. “Our hope was to come out of this race with the points lead. That did not happen, but we’ll do everything we can to catch back up. “On the up side, we had the chance to interact with new fans. Being a new location for us to race, we could introduce our paradise home to more people, which is one of the things we love most to do.